Do I need to have an attorney for mediation? You are by no means required to have an attorney present for a mediation, but some people find them to be helpful, particularly if you are already involved in litigation. The process is slightly different depending on whether clients are or are not represented by counsel, but both methods are successful. What sort of issues can be resolved through mediation? There are many types of mediation that can be used to resolve almost any sort of civil issue. Family Financial Settlement mediators are trained to work with all issues of family law to resolve issues of child and spousal support, custody, and equitable distribution. Other mediators work to resolve contract disputes, negotiate partition sales, and resolve all sorts of civil litigation matters. Arbitration is another way to resolve a dispute that does not involve a Judge. Both sides present their case to a neutral third-party, who makes a legally binding judgment in the matter. Arbitration can be more costly and time-consuming than mediation, because your attorney actually has to prepare your case to present to the arbitrator in a similar way as they would prepare for a court hearing. Mediation is a method of alternative dispute resolution that encourages parties to resolve issues in a non-adversarial way with the help of a trained, neutral mediator. Mediation may be with or without the participation of attorneys, depending on the preference of the parties, and the stage in the process at which mediation is initiated. 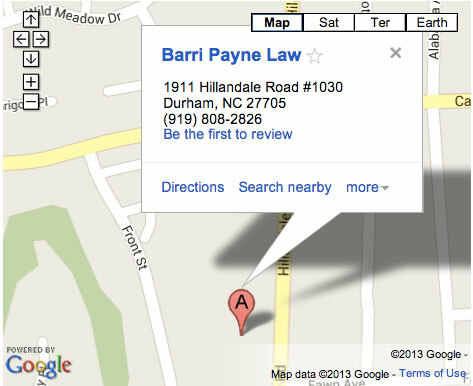 On November 21, 2011, Barri Payne received her certification from the N.C. State Bar Board of Legal Specialization as a specialist in family law. Barri was one of 12 lawyers across the state certified this year in family law. To be certified as a specialist in family law, a lawyer has to meet several criteria including: Licensed as an attorney for over 5 years Devote a substantial portion of their practice to family law Attend many hours of Continuing Legal Education (CLE) seminars in family law Be favorably evaluated by other lawyers and Judges through a peer review process Pass a written comprehensive family law exam which is given one time annually Barri is available for consultations on family law matters such as separation, divorce, child custody, support, separation agreements, or adoptions and is also a certified family financial mediator.